A fertility specialist says his latest research underlines the "drastically successful" effects of a cheaper, non-invasive alternative to IVF. A trial led by Auckland University expert Dr Neil Johnson found that nine out of 12 women who had their uterus bathed with lipiodol, or poppy seed oil, became pregnant. All the women had a history of infertility and endometriosis, a problem with the womb lining that affects up to a third of women struggling to conceive. Johnson believes the oil helps embryos stick to the endometrium, the mucous membrane lining the uterus, boosting chances of it implanting. "It's a good value, low-cost alternative to other therapies that are being offered, like IVF," said the associate professor in obstetrics and gynaecology. "It has a drastically successful effect but there's an amazing hesitancy of the medical profession to take it on." Details of the nine-month trial were revealed at the World Congress on Endometriosis in Melbourne in March. Johnson focused on the oil's effect on the uterus after a 2003 study suggested it didn't need to flush the fallopian tubes to work, as was previously thought. He gathered cell samples from his subjects' endometriums, which suggested the oil helped embryos stick and changed up to eight genes thought to boost the endometrium's receptiveness to implantation. Johnson said he hoped future research would pinpoint which of those genes were responsible. The study also suggested the oil helped to regulate genes involved in cell signalling and immune function, which stopped a woman's body from rejecting the embryo. "The study is exciting because it suggests that we may be correct in our idea that lipiodol is improving the endometrium," Johnson said. "That's very exciting because no other study has shown how the endometrium can be improved. So it has the potential to open up areas in fertility research that have never successfully been opened up before." One of Johnson's subjects was Auckland retail pharmacy manager Julie Evans, 40, who struggled for three years to get pregnant. She had mild endometriosis but her infertility was unexplained. Three months after she had the lipiodol treatment she became pregnant and now has 15-month-old Logan. She said she would recommend the treatment, which she likens to a smear test. "It's surreal to live the dream. I had wanted it for so long." Since the conference, specialists from Sydney, Brisbane and Britain have inquired about the treatment. Kiwis can access it privately in Auckland at a 10th of the cost of IVF, which costs up to $10,000 a cycle. 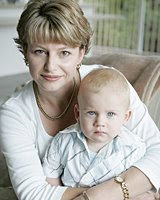 Johnson's latest study was backed by Auckland University, Fertility Plus, IVF Auckland and the Auckland Radiology Group. Dr Richard Fisher, medical director of Fertility Associates, Auckland's biggest provider of infertility services, said the research looked "good quality" and suggested lipiodol "may well be useful". "But that doesn't say we will embrace it yet until we have other data supporting it." Johnson said it was too early for firm conclusions but lipiodol was an effective first-line treatment for couples with unexplained infertility. He said it would not be appropriate for women with blocked fallopian tubes and was less successful for those without endometriosis. Study: A Review of the Use of Lipiodol Flushing for Unexplained Infertility.